I’ve been off the grid, as they say, for the last little while. Been very busy. In particular I’ve started reviewing the mountains of footage that we’ve shot over the past 14 months on the intuition film. I’ve had to spend a little while skilling myself on Final Cut Pro 10, which is a Non Linear Editing software programme. I’ve sat in editing rooms for God knows how many hours these past thirty five years, and as a director I feel I know editing pretty damn well. But actually operating the software, and understanding how it works, and learning all the shortcuts, is a whole other ball of wax. Not that I’m editing the film. I’m not. The very talented young Indian fellow who has edited the two sizzle reels will be the editor. His name is Rishi, and I will enjoy working with him. Basically what I’m doing at the moment, as I wait for more funding to come in, is I’m going through all the interviews and selecting the “grabs” that I’d like to use in the film. Those are all the soundbites that interest me, and that I feel could have a place in the movie. I’m then binning those grabs, and later I will put them into a rough structure, so that when Rishi kicks in, he’ll have something very rough to get his teeth into. I’m a very lucky man. 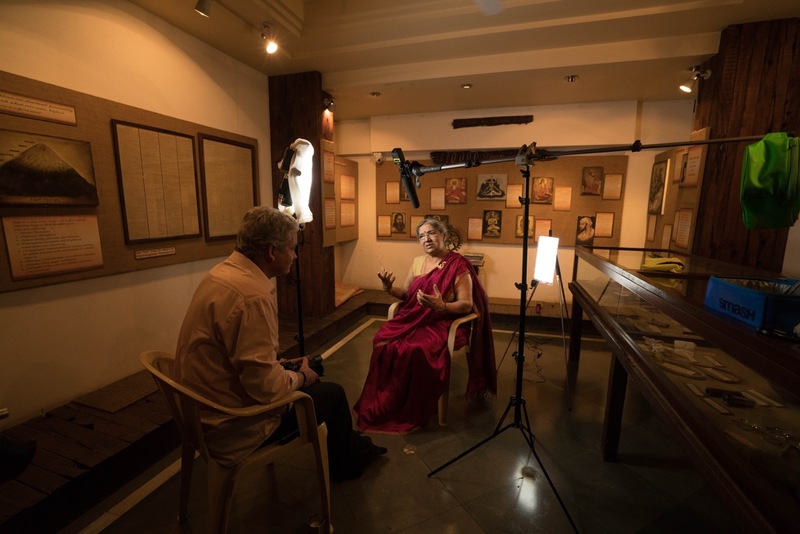 I was lucking getting to interview these extraordinary people in the first place. Now I’m lucky because I can play back those interviews at my leisure, and in selecting my grabs I play back certain sections again and again, so I get the opportunity to really take in what they’re saying. From time to time on this blog I’ll post up some interesting things that I’m discovering in reviewing these interviews. But I just wanted to post here a section that may not even make it into the film, but which I’ve been thinking about since I reviewed it. 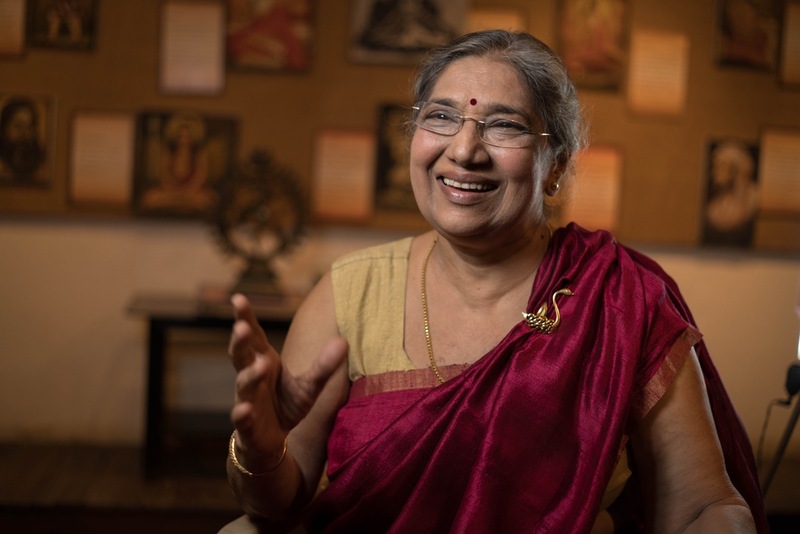 The interview is with the head of the Bombay Yoga Institute, a venerable woman named Hansaji. She talks about how we create pain because of our doubts. Our likes and dislikes, our desires. Our ego creates these doubts, desires, she says. If something goes wrong, that you believe has gone wrong, you think about it all the time – while you’re working, relaxing, eating. This is not life, she says. Learn from it, then forget about it and move ahead. It’s just a chattering box, she says. Your mind. If you can learn to quieten your chattering box, then you will experience intuition. Your inner voice. You can avoid pain, you can avoid suffering, she says, if you listen to your intuition. But, she says, you can’t experience intuition with a rational mind. What I found most interesting though is what she said about results. She talked about work – that we should just get on with our work and not worry about results. She said that if in your work you have a good result, then your ego will take the credit and will run rampant and you will be very happy. If you have a bad result you will blame yourself and others, your ego will be shattered, and you will be very unhappy. In each instance it’s your ego that’s ruling you. Controlling you, and your emotional body. But Hansaji says, if you don’t worry about the result, and trust that your guidance is directing you in the right way, then you won’t be a slave to your ego – good or bad. But she says for this to work effectively, you have to have trust in that guidance. We are such a goal orientated society. We’re taught to be competitive, aggressive, to be winners. But what if we chose not to play that game? What if we just put our effort into the quality and substance of what we do each day, and trust that the result of those efforts is in the hands of our universal guidance. Wow, Bill, such a simple concept, yet so very hard to achieve, to just let go, to trust!! It all comes down to what you believe Britta. Plenty to talk about on Saturday! Great sizzle and an interesting take on Don’t worry Be Happy… my simplistic way of agreeing. As you walk through Spring, I am enjoying the last few weeks of a most gorgeous Autumn. Soon, we will feel “old man winter’s breath” and not sure how often I will venture out to maintain my walking routine. Hi Bill, great subject matter. I’m happy to help with make-up for the re-enactments if it is required or anything else. Bill, this is so impressive. Congratulations. Your movie, so far. looks terrific. Kickstarter? ?